The libraries at Radharaman Group of Institutes acquire a prominent place among the students and the faculty members. All individual colleges are provided with their respective libraries, having rich collection of relevant books and journals. The total collection of the books in the library is more than 27620 in rits 14484 in rec 11072 in rirt, 4276 in rcp and 2980 in rips. The libraries provide to students, staff and faculty members, the services for updating their knowledge and supporting research excellence with innovation and creativity in teaching/ learning activities. At RGI these services are provided through the institutional and departmental libraries. 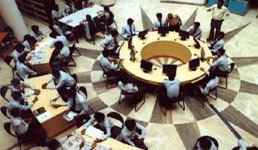 To keep proper pace with the fast changes in technology, the knowledge hub of the library is enriched regularly by addition of new literature in the forms for text books, reference books, reports, proceedings, abstracts and indexes, encyclopedias, data books, standards, journals and data base on CD Roms. Certain new sections and services are also being introduced to raise the library standard to ISO- 9001-2000 standard. This section has huge collection of titles, covering the different areas of science and technology and is open to all students and faculty members for borrowing their desired books. Quite a large number of reference literature in form of encyclopedias, hand books, standards, reports, proceedings, abstracts and indexes, data books etc. are provided in library for ready reference. A good collection of Indian & Foreign journals and periodicals on related subjects of Science & Technology are available, as the primary source of information for supplementing the research activities. Several Foreign and Indian Online journals, namely IEL, ASME, ASCE, Science, Digest and Springer Link etc. are available to facilitate the undertaken research activities and to expand the areas of future research activities. Good collection of books on English and Hindi literature is provided for leisure reading. Also available are books on other important subjects like History, Sociology, Commerce Economics etc., apart from the local and national level news papers in Hindi and English to give current information. The facilities like photocopying, scanning, printing, spiral binding, laminating etc are available within the premises of the library. CD- Rom database like BIS, ASTM, EI Index etc are subscribed for the benefit of students and faculty. A good collection of books on CD-Rom and video recordings in also available in library. In order to increase the accessibility, the library records are computerized. The faculty and students can access the information at their work place. This not only save their time but also, make it possible to access the same information, simultaneously by many persons at different places, which is not possible in case of printed literature and formats. Widely used library management software “LIBSYS” is installed for this purpose. 15 P-IV Machines are provided to facilitate the retrieval of information through internet and intranet. Online Public Access Catelogue (OPAC) of books, journals, CDs and videos available in the library, can be accessed through intranet. Several resourceful links on engineering science and technology, have been identified and made available on the library web page. This includes the list of subscribed and free on-line journals/ resources/ references/ database and list of research papers available through institutional archives. Being a member of consortia of Indian Digital Library of Engineering and Technology (INDEST) and Developing Library Network (DELNET), library offers various facilities of other member institutions through resource sharing. A constant vigil is kept on the activities of staff and users through electronic surveillance system, having a 24 hours recording facility, so as to provide efficient management. Updating data of existing collection and recording data entry of new arrivals. Bar coding of existing collection and recording data entry of new arrivals. Bar coding of membership cards and incoming records/ documents. Procurement/ upgradation of Hardware and Software. Continuous internet search is done for identification of new resources for subsequent development of library home page. Presently the Campus has around 1000 computers connected as a LAN. It is providing internet access (4 Mbps) leased line and programming facilities to all software related laboratories of all the departments such as Computer Science, Information Technology, Electronics and Communication, Electrical and Electronics and Basic Science Departments. 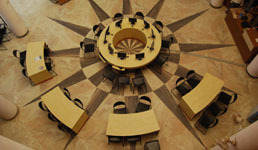 The academic and administrative blocks of RGI are interconnected using LAN. 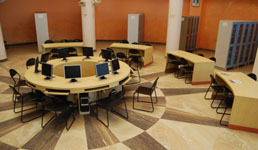 The Administrative block, training and placement cell seminar hall and library are also connected with LAN. It is proposed to interconnect the presently existing LANs through optical fiber cable Network.